Welcome to www.RhodesFamily.org, aka "The Back Rhodes of Our Genealogy" website! 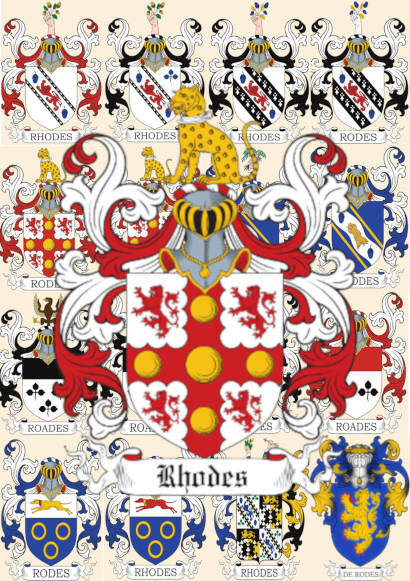 History of the Rhodes Family name. English (chiefly Yorkshire): topographic name for someone who lived in a clearing in woodland. This, the most common form of the name, has been influenced in spelling by the English name of the Greek island of Rhodes (Greek Rhodos), with which there is no connection. Hi, This is Carl, the host of this site. My wife, Elaine and I have been doing our family history for well over thirty years. I can't think of anything I would rather do than learn about our family, and the times in which they lived. I truly hope with some of these pages you find some of your long lost kin. As many pages are not linked on any web page on this site, so before browsing the links in these pages, you should first use the search boxes located on this page to look for your ancestor. Some site have two search engines located ether side of the web pages, for best results use both. Many of the page links are no longer updated due to the mass of the site. Also, check out the dropdown menus at the top of the page.